Designed in top-notch style and durability, this Carolina Forge full back bar stool is sure to spruce up your kitchen. Crafted with a traditional style, it's sure to blend easily into a variety of kitchen decor. The green base frame colour adds a fun style punch, and is surprisingly easy to match with many decor colours and styles. A terrific addition to any kitchen counter or breakfast island, this beautiful Home Styles full back bar stool combines top-notch design and durability for a truly timeless piece. You'll love its traditional style, perfect for any room in your home. Its stunning oak coloured base frame is surprisingly easy to match with other decor. Give your kitchen counter or breakfast island a touch of style with this beautiful Linon Home Dicor Products full back bar stool. Crafted in a traditional style, it's sure to be a great fit for a variety of room decors. The black base frame colour gives this piece a stylish vibe, perfect for bringing a touch of flair to any room. Let the style and practicality of this Linon Home Dicor Products full back bar stool spruce up your morning routine at the kitchen counter or evening routine having a drink with friends. Its traditional style makes it an easy fit in any room or location in your home. Styled with a modern black coloured base frame, it fits seamlessly into many trendy decors. Give your kitchen counter or breakfast island a touch of style with this beautiful Linon Home Dicor Products full back bar stool. Crafted in a traditional style, it's sure to be a great fit for a variety of room decors. This base frame is designed with a beautiful bronze finish that adds a touch of style to any decor. 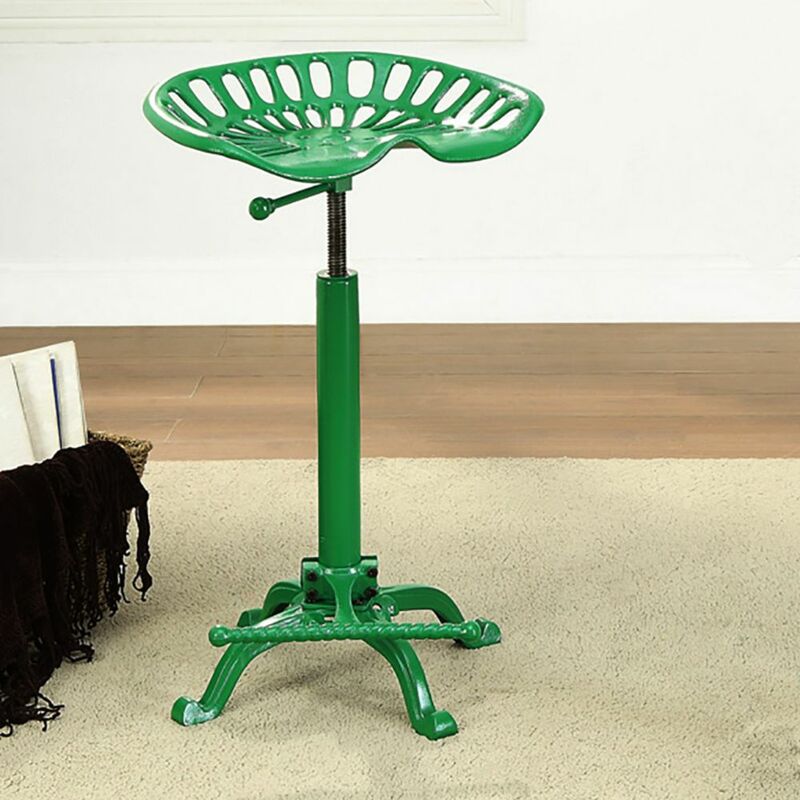 Tractor Seat Metal Green Traditional Full Back Armless Bar Stool with Green Metal Seat Designed in top-notch style and durability, this Carolina Forge full back bar stool is sure to spruce up your kitchen. Crafted with a traditional style, it's sure to blend easily into a variety of kitchen decor. The green base frame colour adds a fun style punch, and is surprisingly easy to match with many decor colours and styles. Tractor Seat Metal Green Traditional Full Back Armless Bar Stool with Green Metal Seat is rated 4.0 out of 5 by 3. Rated 2 out of 5 by Rick from Made for short bar counters. Just slightly taller... Made for short bar counters. Just slightly taller seat than a dining chair. Rated 5 out of 5 by Rosa from Easy to assemble. Very sturdy. Looks great!... Easy to assemble. Very sturdy. Looks great!